One of my very favorite made-in-Montana movies is one that you've probably never heard of: Danger Lights, a black-and-white drama released by RKO way back in 1930, in the early years of the talkies. The film is mostly a romantic drama with a fairly standard and cheesy plot -- two railway employees battling for the affections of a young Jean Arthur. But the railroad setting makes makes it both historically noteworthy and lots of fun ... those scenes were shot in Montana, along the Milwaukee Road's main line across the state. There are action shots in remote Sixteen Mile Canyon, and lots of evocative images of steam locomotives in the railway's Miles City roundhouse and yards. They're great views by any standard, made all the more interesting to me by their location ... and their portrayal of a legendary, now-vanished railroad. You're right...I never HAVE heard of this one, but now that I have, I'll hunt it down and watch it! Love old movies and there aren't many Montana ones. 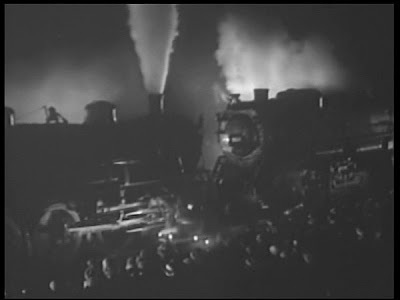 Some of the scenes near the end of the drama show a train moving much too fast into Chicago Union Station after a "flight for life". For one who knew the Railroad it was an improbable composite of track segments but great for historic preservation of the existing places and equipt. But it's a great film, regardless ... so many spectacular scenes from the steam era that you'd be hard-pressed to find anywhere else. Wow, that's extremely cool ... I had no idea that car was still around!